Annually, we get a new flowchart from the Lawrence Livermore National Laboratory. 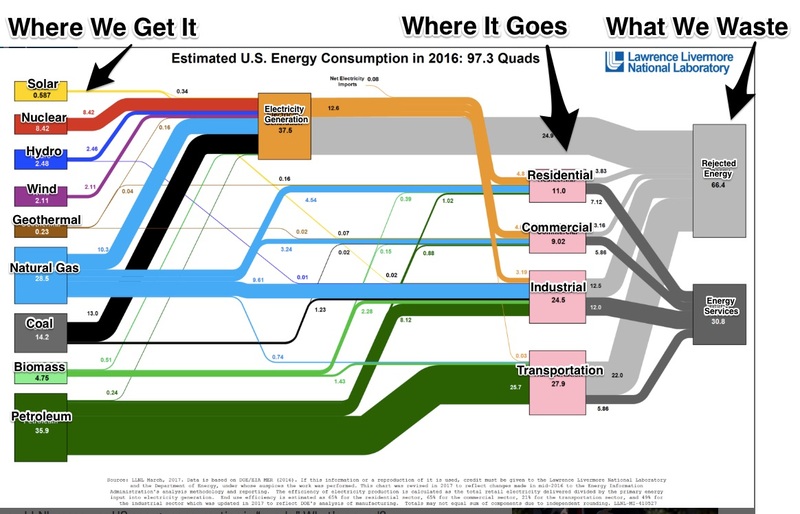 Showing where our energy comes from and where it goes, the chart is a handy snapshot. Alone, it illustrates the panorama of U.S. energy. 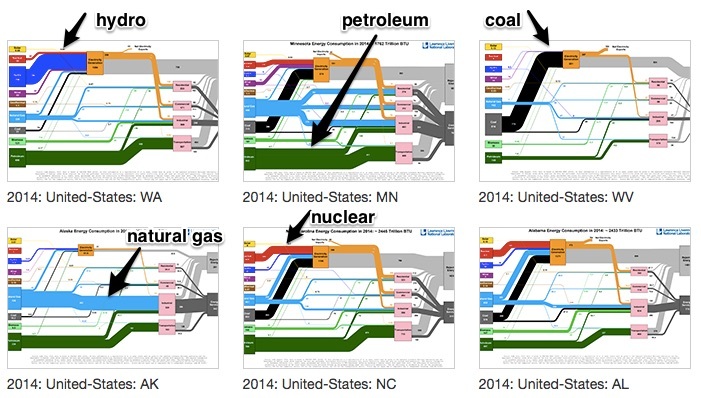 Together, charts from several years tell us how our energy use has changed. And finally, since they’ve done diagrams for individual states, we can compare the whole with its parts–and compare the parts too. Looking back to 2015, the overall total is pretty much the same. However, we are using less coal, more solar, more wind. Looking at their destination, only transportation’s energy use was up. Here it gets even more interesting, but the differences are predictable. Dollar incentives affect energy supply and demand. As the price of solar panels has dropped, our use has increased. With wind power, we have gotten better at siting and building wind farms. But even more crucially, government subsidies have supported the wind power industry. Then, for petroleum, when the price of gasoline plunged, we started driving more. You can see that energy inevitably takes us back to the market. When the supply and demand of specific sources of energy get cheaper, we use more. My sources and more: Amazing is the only way to describe the spaghetti diagrams in this Vox article. But it gets even better when you visit the Livermore site and compare more of their charts. Finally, for a short and clear comparison of the past two years, this AAAS article is good.